The Kick is capable of beefy drum and bass sounds that belie its compact form factor. A must try for club-focused producers. Accent, Bend Reverse and Slide are great for shaping percussive basslines. Analogue Drive circuit adds grit and harmonic character. Stepped Pitch control makes fine-tuning awkward. At first glance, you’d be forgiven for thinking that the latest addition to Korg’s Volca range is a touch limited. Given that previous iterations have condensed polysynths, a drum machine and a multi-channel sampler into the familiar Volca format, an instrument that deals in just a single channel of synthesized kick drums might seem like a downgrade. Yet the Kick’s beefy analogue synth engine is capable of a broader range of sonic results than its name would suggest. The Kick is a derivative of the MS-20 filter section. Its sound engine is based around the original low-pass filter with resonance pushed up into self-oscillation, effectively creating a tunable sine wave oscillator. The filter itself has three controls. Firstly, Pitch/Octave, which tunes the sound by adjusting the filter cutoff point. With this control turned fully left the output is tuned to a chromatic scale (starting at a low A) when played via the touch keyboard or a MIDI note input. Holding Function while turning the control allows the tuning to be adjusted in increments of one octave, making it simple to play the Kick melodically. Without Function engaged, the Pitch control changes the tuning by smaller increments, although these are noticeably stepped, which makes fine-tuning adjustments a little awkward. Next are a pair of controls labelled Bend and Time, which are used to add an envelope-controlled pitch sweep to the sound. The former adjusts the amount by which the envelope is applied, while the latter dictates its length. This source sound is then shaped via a two-stage (AD) amp envelope and Pulse section, the latter of which adds an attack-boosting click sound, with controls for adjusting its level and tone. The sound then travels through an analogue Drive circuit, which is great for adding body and grit. Finally there’s the Tone control, applying a 12dB/octave low-pass filter for rolling off high frequencies. The Kick’s sequencing workflow will be familiar to anybody with experience of previous Volcas. Again, control is provided by a touchstrip that doubles as a 16-step sequencer and chromatic touch keyboard. Sequences can either be recorded on the fly or step inputted, although if you want to input melodic sequences via the latter approach it requires sequencing note positions and then ‘overdubbing’ pitches, as the sequencer always defaults to the keyboard’s low A. The Kick benefits from a number of sequencing tricks honed on the preceding Volcas, including Motion Sequencing, which allows the bulk of the sound parameters to be automated, and Active Step for tweaking the length of sequences on the fly. Beside these are rotaries for adding Swing and Accents, which is applied per-step via the sequencer. and a Bend Reverse mode (see Roll and Reverse). The Kick’s Beat Roll and Bend Reverse functions provide handy tools for adding variation to patterns. The former is a beat repeat-style effect that can insert on-the-fly trills in beat divisions of 1/4, 1/2, 1/1, 4/3, 2/1 and 3/1. The latter, meanwhile, allows the direction of the filter’s pitch sweep to be reversed for selected sequencer steps. This is a handy tool for adding a bit of movement and variation when sequencing basslines. Particularly when coupled with Slide and some Motion Sequenced automation, it makes the Kick capable of some deceptively complex and creative patterns. As with previous Volcas, this all makes Kick far more flexible than it might first appear. There are a few functional annoyances here though. For one, the lack of a built-in metronome (as found on the Volca FM and Sample) is fairly noticeable. Effectively it means that to input melodic sequences users need to rely on an external clock, a bit of rhythmic guesswork or the slightly convoluted sequencer workflow. Also the built-in speaker - a feature of the whole Volca range - is pretty much redundant here. These were never the best-sound speakers, but here the (laudable) low-end power of the Kick’s synth engine and relative weakness of the speaker means that the output rarely sounds anything but horrible. The main output is fairly noisy too, and you’ll likely end up needing to use a gate and a little EQing if you want to achieve pristine recordings. That aside, the Kick is great. Its sonic remit reaches beyond simple drum hits; with the envelope decay pushed up and a little mid-range body added via the Drive, it becomes a fantastic machine for creating percussive basslines. It’s great for sub-heavy, 808-style Hip-Hop bass or the rugged tuned toms common throughout Techno. Crank the pitch control up and it can do ‘zap’ like FX and pizzicato melodies too. As for its kick credentials, this Volca certainly doesn’t disappoint. 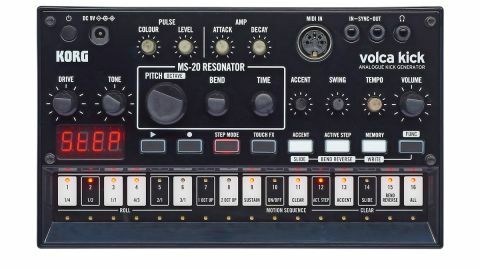 MS-20 owners will attest to the filter’s ability to create beefy drum hits, and the additional Bend controls, Pulse section and snappy envelope really refine this, allowing the creation of punchy, hard-hitting and full-bodied kicks. The analogue Drive is the cherry on the cake here though, adding bite and gritty mid range harmonics. Even taking into account more high-end drum machines, this is probably the best source of hardware kick drums we’ve tried. If you make club-focused music that relies on the foundation of solid kicks, this little box of bass comes highly recommended.